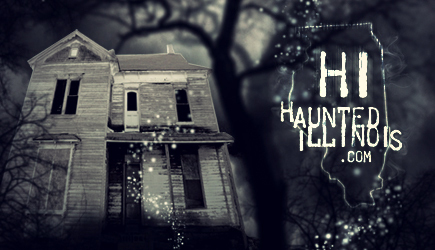 Is It Really Haunted? And If So, Do the Lincoln's Really Walk Here? By 1844, Lincoln was able to afford to purchase a home in Springfield. 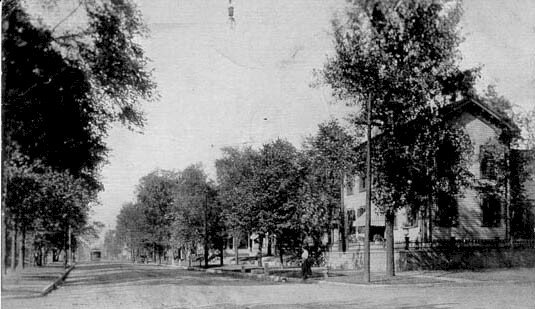 It was a one- and-a-half story cottage at the corner of Eighth and Jackson Streets, not far from Lincoln's law office in the downtown district.. The Lincoln's lived in the house from a period shortly after Robert was born until they moved to Washington in 1861. The house was originally built in 1839 by a Reverend Dresser and was designed in the Greek Revival Style. Lincoln purchased the home in 1844, while it was still a small cottage. It had been constructed with pine exterior boards; walnut interiors; oak flooring; and wooden pegs and hand-made nails held everything together. In 1850, Lincoln improved the exterior of the property by having a brick wall constructed and by adding a fence along Jackson Street but nothing major was done to the house until 1856. At this time, the house was enlarged to a full two stories, adding new rooms and much needed space. Today, the house is presented in much the same way as it looked during the Lincoln years. It is now owned and operated by the National Park Service and they are not publicly thrilled that the house has gained notoriety as a "haunted" site. They have always maintained that no ghosts walk here, although many of the witnesses to the strange events have been former employees and tour guides of the house. For many years, stories have circulated about the apparition of a woman lurking about the house. Many pass this off to wishful thinking, but in more than one circumstance, the image has been spotted by multiple witnesses. A number of years ago, the Springfield State Journal-Register newspaper interviewed some (then) current and former staff members of the house, all of whom claimed to have had brushes with the supernatural here. At that time, a woman named Shirlee Laughlin was employed at the house as a custodian. She claimed that her superiors were very unhappy with what they termed her "vivid imagination". But were the events she experienced really all in her mind? In her interview, Laughlin claimed to have experienced ghosts in the house on many occasions. "I don't see the images as such," she said, "I see things happening." Among the things she witnessed were toys and furniture that could be found in different rooms of the house at different times, seemingly moving about on their own; unlit candles that would mysteriously burn down on their own; and Lincoln's favorite rocking chair rocking back and forth under its own power. "At times, that rocking chair rocks," she stated, "and you can feel the wind rushing down the hall, even though the windows are shut tight." Laughlin also recounted an occurrence that took place while she was rearranging furniture in Mary Lincoln's former bedroom. Besides being a custodian, she was also an expert on historic home restoration and would often attempt to recreate the layout of the household furniture as it looked when the Lincoln's lived in the house. She was in the bedroom alone one afternoon when someone tapped her on the shoulder. She looked around the room, but there was no one there. She decided to leave the furniture the way she had found it. And that was not the only weird experience from the time that she spent working at the house. Another anecdote concerned a key which turned up missing from a wooden chest in Mary's room. "We looked everywhere for it," Laughlin reported, "then one morning it just showed up in the lock with a piece of pink ribbon tied to it." No explanation was ever discovered for where the key had been or for who had tied the piece of ribbon around it. One former guide said that she was on duty at the front door one afternoon when she heard the sound of music being played on the piano that used to be in the parlor. She turned to stop whoever had touched it and found that no one was in the room. Another ranger who worked in the house recalled several occasions when strange feelings, and the touch of invisible hands, caused her to close up the house quickly on some evenings. And again, she wasn't alone either. One ranger, who spoke to me anonymously, told me of one late afternoon when she was in the front parlor by herself. There is a display here of some of the items that could commonly be found in households of the period, including some children's toys. As she was standing in the room, she caught a movement out of the corner of her eye. When she looked, she saw a small toy as it rolled across the floor on its own. She didn't stay in the room very long. Staff members are not the only ones to have odd encounters. A number of tourists have also noticed things that are a bit out of the ordinary, like hearing voices in otherwise empty rooms; hearing the rustle of what sounds like a period dress passing by them in the hallway; experiencing unexplainable cold spots; and most common, seeing that rocking chair as it gently moves back and forth. One tourist, an attorney from Virginia, even wrote the staff after he returned home to tell them of his own strange sighting. He claimed to see a woman standing in the parlor of the house who abruptly vanished. He had enough time to recognize the woman as what he thought was Mary Lincoln. But was the ghost really Mary? For those who believe the house is actually haunted (The National Park Service maintains that it is not! ), they believe the ghost here is not actually one of the Lincoln family, but rather a later occupant of the house, Mrs. Lucian A. Tilton. Mrs. Tilton and her husband, the president of the Great Western Railway, had rented the home from the Lincoln family when they left for Washington in 1861. However, after the president's assassination, his body was placed on display in the house when he was returned to Springfield. Mrs. Tilton had been constantly plagued by visitors during the four years that she lived in the house, prior to 1865. They estimated that at least 65,000 people had visited the home and asked to take a tour of it, ringing the bell and knocking on the door day and night. Needless to say, Mrs. Tilton was worried about what might happen to the house during the Lincoln funeral but she was a kind-hearted person and had already resolved herself to the fact that she was going to allow people to take grass from the yard, flowers from her garden or leaves from the trees. She had no idea what was coming --- by the end of the funeral services, her lawn and gardens had been stripped, paint had been scraped from her house and bricks had been carried away from her retaining wall as souvenirs. The Tiltons moved out of the Lincoln home in 1869 but some believe that Mrs. Tilton has never left it. There are those that believe the ghost who lingers here, and who has been seen on many occasions cleaning and straightening the house, is the beleaguered Mrs. Tilton, still worried over the disruptions that continually marked her brief tenancy in this famous home.